West London-based fun games distributor Brent Sales will use ATEI 2006 as the launch pad for the latest addition to its extensive product range, Rockin' Bowl-O-Rama. 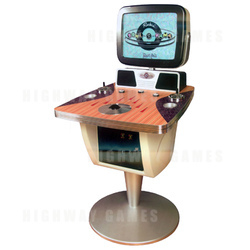 Housed in an ultra-stylish retro pedestal cabinet with integral trackball control and TFT display, this video bowling game captures all the excitement and strategy of various bowling alley competitions and fuses them with a nostalgic range of classic 1950's songs. Rockin' Bowl-O-Rama offers players a choice of four different game types including standard regulation ten pin bowling in half- or full games or as a three-game series. Bowling with a twist comes in the form of 'Trick Shot', where players try to pick up difficult spares using spin and swerve; Ten Pin Poker, in which a card is awarded for each strike or spare with the best poker hand winning the game; and Blackjack Bowling, whose objective is to knock down 21 pins from three full racks. Up to four players can participate in all game types with buttons on the play field allowing for selectable options including ball type/weight, instant (slow motion) replay, score sheet and even a jukebox 'jolt', which instantly changes the music track being played. Life-like control is achieved by manipulating the trackball in different ways to generate spin, hook, slide, curve and straight deliveries, whereby finesse is far more important than brute force. "Rockin' Bowl-O-Rama is a fantastic game on any level," said Brent Sales Product Manager, John Brennan. "The design is truly awesome and will draw players in wherever it's sited, whether that's an arcade, pub, club, bowling alley, entertainment centre – it can go virtually anywhere. The game play, graphics and sounds are simply superb and will provide as much entertainment and enjoyment to casual players as they will realism and response to seasoned bowling pros."